This year, I left some of the elements from my autumn tablescape – the burlap and chocolate table runners and the birch slab – out for Christmas. I used a pair of brass deer that I found at Goodwill and a gold mercury glass tree from Michaels in the center along with gold and silver mercury glass votive holders from Target. The snowflake plates also came from Target and are paired with our wedding china and silver glass chargers that also came from Goodwill. I did not attempt the ornament chandelier this year, just to keep things more simple on myself. I bought some vintage Christmas ornaments last year. When trying to decide how to display them, I pulled out the large lantern I got from Lowes on clearance in the fall. The ornaments no where near fill the lantern, but it gives me space to build on my collection each year. I also added a second mirrored tree that I found at Bealls to the powder room this year. I did not really change anything in the foyer this year. I love this one-piece nativity and it fits so perfectly under the large cloche. I decided to go back to my traditional bow topper this year. I kept the red blanket as the tree skirt, though we have so many gifts under the tree this year that I don’t think the cat can even get under there for the time being. Our new ornaments this year include a Golden Gate Bridge from San Francisco and a Biltmore ball from our anniversary trip to Asheville, NC. 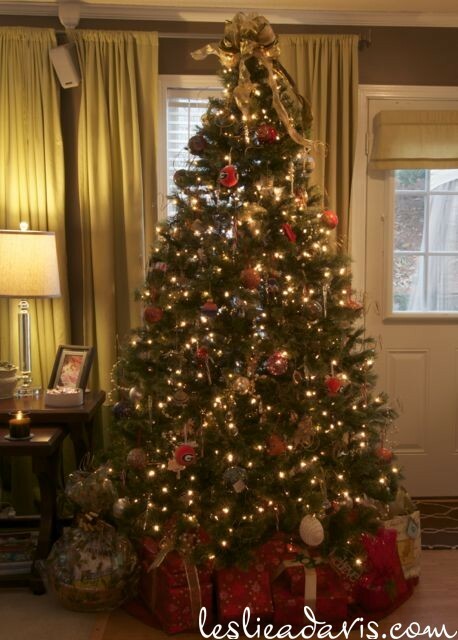 See my Christmas Tree and special ornaments from over the years here. 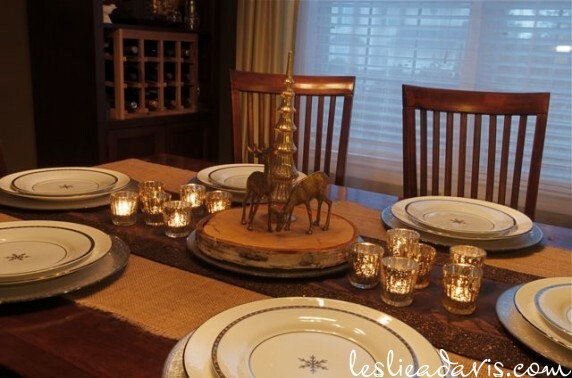 See my Christmas Tablescapes from over the years here. 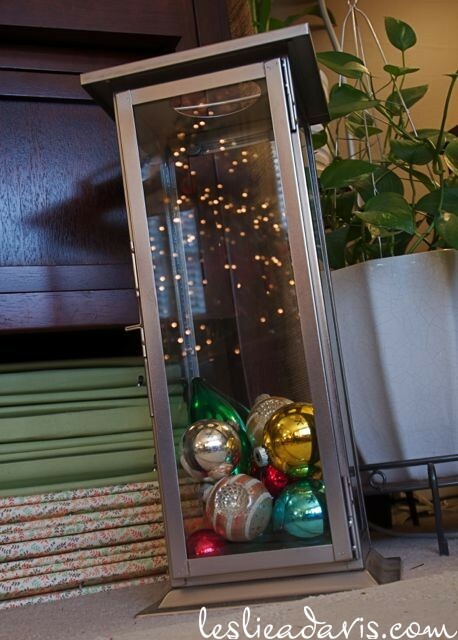 See my favorite tabletop decorations and nativities here. See my UGA wreath and DIY Christmas card holder here. This entry was posted in Holidays on December 16, 2012 by Leslie. 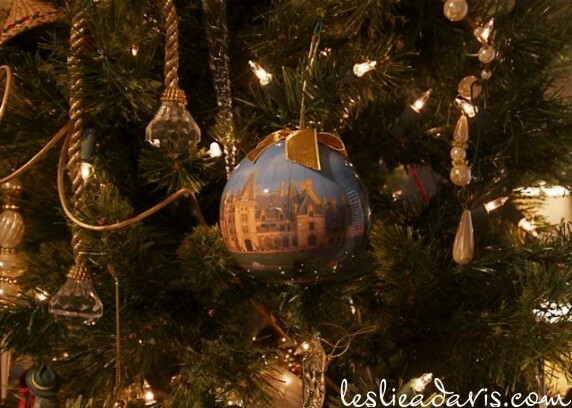 Ah – I spied your Biltmore ornament! 🙂 Popping over from the Nester’s party – Merry Christmas! Your home is lovely! 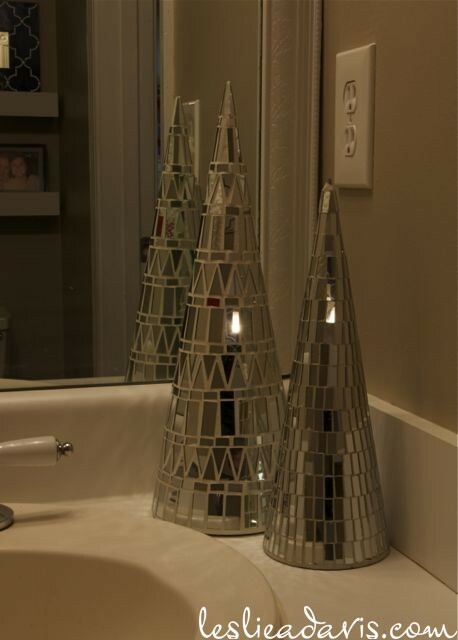 I especially like the mirrored trees in the bathroom and the gorgeous Christmas tree. 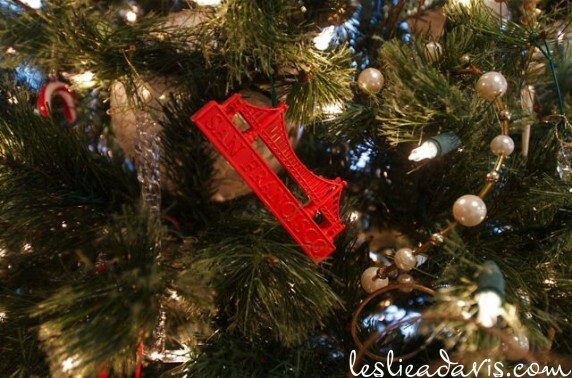 Did you make the bow on top of your tree? It looks great! I have a full size Christmas tree for the first time in many years, and it is currently without any sort of a tree topper. I like the bow idea! I may just have to raid my ribbon stash and create a bow topper. Thank you! My mom made the bow years ago when I was in high school. She let me take a lot of the ornaments and the bow when I got a home of my own. I would probably make the bow tails a little longer if I were making one now, but it is beautiful. Merry Christmas! Welcome! Thank you for your comment and Merry Christmas! I love your entry way table, I have a similar space that I have been puzzling over for awhile and now I’m totally inspired! I’m visiting via the home tour at thenester.com. Your home is truly lovely. Hope you have a very merry Christmas. Thanks and welcome to my blog! That small strip of wall was just calling out for a little table when we moved in. I got it from Amazon (the half moon Concord Accent Table). Merry Christmas! Thank you Lexi and welcome to my blog! Merry Christmas! Your home looks gorgeous all decorated for Christmas. I am visiting from The Nester. Welcome Judy. Thank you for your kind comment. Merry Christmas!